Spring is in the air! I have been giving the “I’m watching you” eyes to my linen suits in my closet. I know the rules: linen suits are relegated to the closet except between Memorial Day and Labor Day; official summer months only. Despite that, there have been a few days in the high 60’s, and probably they were over 70 in the sun. And that makes me want to break out my linen suits! Or, at least start to wear the summer colors. And to go along with that “summer is coming” feeling I am taking full advantage of the spring fruits in my cooking! As with most salads, this one is fairly simple. Chop the ingredients, mix them all together, and you have your salad! So let’s talk about the ingredients instead! I find that Kale is a seasonal treat. For “Spring” flavors, I find myself looking at “Baby” vegetables. And yes, I tend toward the mature plants in the summer and fall too – it just works out that way. I am sure that there is some science or chemistry behind that, but I’m not going to get in to that. I just think that this spring salad is supported by the “light” flavors of the baby kale. It’s a great vegetable, and the flavor of the “baby” version is just perfect for this salad! If I were to use other greens, I would likely go with “baby” spinach, or a “spring mix” of vegetables. Kiwi and strawberry. For some reason, that seems to be a seasonal mix, though from the perspective of the individual fruit, I can’t imagine why… Kiwi is an autumn fruit, though mostly grown near the equator where seasons are less obvious. Strawberry is a spring fruit. Either way, I’m happy eating them together. Their flavors are definitely complimentary, and they make this salad quite delicious! 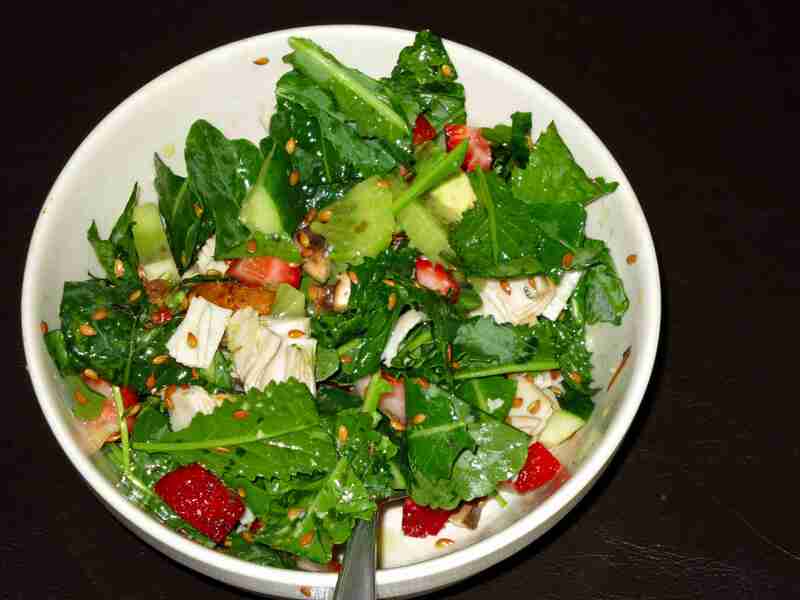 In fact, as much fun as strawberry has been for me this spring, I think that the inclusion of the kiwi and the baby kale is what really sets this salad apart; or brings it together. These ingredients make a cohesive and delicious salad! I have a few quest posts coming up. The most interesting is a Paleo Cocktail which I will be trying to put together. Do any of you have a particular cocktail that you like/love and have been doing a Paleo version of? What kinds of “Spring Salads” have you been eating? I am continue to work on the “Slow-Cooker Smoked Meat” recipe, and have further refined it from the last attempt (though it was quite successful!). Have any of you made an attempt? What was your experience with it? 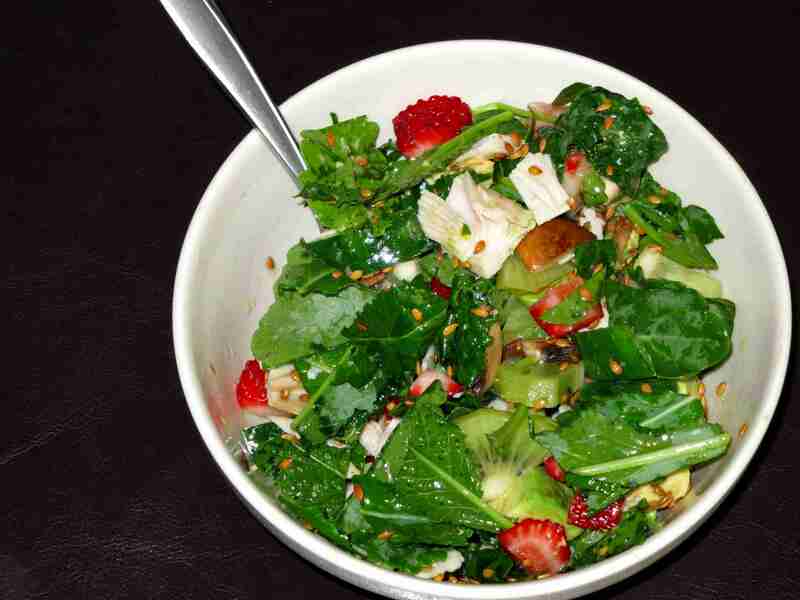 My favorite spring/summer salad is spinach/kale base with fresh berries (strawberries and blueberries) and almonds. Then some sort of balsamic vinegar dressing, so simple and yummy! Great choice! Something about the baby kale or spinach just mixes perfectly with spring berries like strawberry or blueberry. Like I said in the post, I don’t know what it is, but it definitely works! It’s the reason I chose turkey – I wanted a meat that would have a light flavor, letting the berries do all the talking in the salad. It really is a great salad! But I think the baby kale really brought it together. Kiwi and strawberry are a good combination together, but something about the kale just made the dish! Yum – sauteed squid and mussels sounds like a divine breakfast! I would probably put together a quick stir-fry of carrots, sweet potatoes, parsnips, celery, and fennel just to accompany the sea food. Salad for breakfast? LOVE it!!! Me too! I eat salad for more than half my weekly breakfasts – it’s delicious, filling, light, and a great way to get my metabolism started with some premium fuel!